"A Dream Within a Dream" by Edgar Allan Poe was offered by Poets.org's Poem-A-Day on January 19, 2014. A link to the poem, including a note by the editors of Poem-A-Day, may be found here: http://www.poets.org/viewmedia.php/prmMID/16092. An essay about the poetry of Poe was posted in Songs of Eretz on November 11, 2013 http://eretzsongs.blogspot.com/2013/11/you-cant-have-poetry-without-poe.html. The poem is arranged in two stanzas--the first of eleven lines, the second of thirteen. The rhyme scheme is that of rhyming couplets with the exception of two rhyming tercets, one of which opens the poem, the other of which comprises lines five through seven of the second stanza. There are three feet in every line, but the internal rhythm of each foot varies. The editor's note reveals that the poem was originally composed in the 1820s and later revised. Poe would have been only twenty years old in 1829, but it must be remembered that he was only eighteen when his first collection of poems, Tamerlane, and Other Poems, was published in 1827. The second person singular is introduced immediately in the first line. It is not clear whether Poe is addressing the reader, everyone in the world, or perhaps his wife, Virginia, whom he married in 1836. Virginia died from tuberculosis in 1847, exacerbating Poe's alcoholism and intensifying his depressed mood. Poe then introduces the conceit that what we perceive as reality is but a dream or even less substantial than that--a "dream within a dream." The mood here is that of profound depression and loss. "Hope has flown away." In the second stanza, Poe conjures an image of himself desperately trying to cling to reality, each day of which is represented metaphorically by a grain of sand. 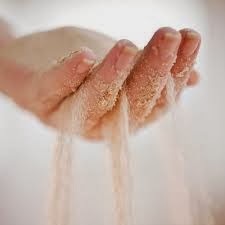 Sand evokes the image of the Sandman--the mythical bringer of sleep and dreams. Alas, the sand slips through his fingers and is washed away by the sea--perhaps a metaphor for salty tears and the relentlessness of time.